The NL121 and NL116 Ethernet interfaces (released February 2015) will replace the NL120 and NL115 for many applications. The 10/100 Mbps communication capabilities of the NL121 and NL116 combined with the advanced IPv6 support provided in datalogger OS 28 allow seamless network operation. These new Ethernet interfaces have internal surge protection, eliminating the cost and hassle associated with using external protection devices. 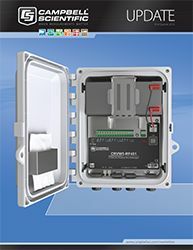 Additionally, the auto-MDIX support provided by the NL121 and NL116 and the auto-IP capabilities new to datalogger OS 28 make it easier to connect IP sensors, cameras, and computers to the datalogger's Ethernet port. To use the NL121 or NL116, the datalogger operating system must be OS 28 or higher. 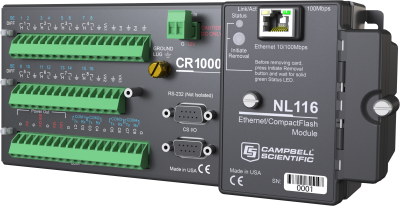 Campbell Scientific will continue to offer the NL120 and NL115 for customers who are using dataloggers with older operating systems. The new NL121 and NL116 Ethernet interfaces combined with the new datalogger operating system capabilities will keep your IP network running smoothly for many years.